Left to right: Jennifer Tipton, Lisa Burton, Stephanie Crowley. Photo courtesy Lance Huntley. While many plays have steep dramatic arcs, others are more laid-back, content to welcome the audience into the characters’ daily lives. 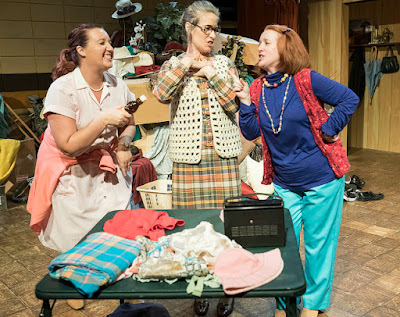 The women of The Charitable Sisterhood of the Second Trinity Victory Church by Bo Wilson, now running at the Dragon Theatre, aren’t caught in life-shattering dilemmas: They’re chatting, trading jokes, and attempting to eke out a little good in the world. This down-to-earth comedy, occasionally punctuated by moments of urgency, makes Charitable Sisterhood a delight. There is no protagonist, technically, in Charitable Sisterhood. However, two characters act as pillars supporting the intricate web of relationships between the cast. One is Lorraine (Stephanie Crowley), a mother of nine with the world-weary practicality that comes with the role. Lorraine has the most centered world view; she’s a realist about her life in a small town in the South, minus the arrogance of Bea (Lisa Burton), the pastor’s wife. Crowley and Burton have some of the best interactions in the play, with Crowley precisely deflating Burton’s affectations of power without seeming too rude. Tina (Jennifer Tipton), a former yankee from Maryland, is the other character who holds up the complex relationships in the play. Tina is the kindest of the three Sisterhood ladies, warmheartedly attempting to unite characters at each others’ throats and trying to do the proper thing even when it’s impossible. She also acts as an audience surrogate, new enough to the community to miss some of its intricacies, while trusted enough for Lorraine to explain them to her. Yet it’s the two outsiders, Janet (Ambera De Lash) and Riley (Caley Suliak) who drive the play forward, spurring everyone’s character development. Janet comes off as a ditz, thanks to impeccable character work on De Lash’s part, but her goofy exterior belies hidden depths that are unexpected yet believable. Riley, a homeless woman who takes shelter within the church, poses numerous ethical questions to the other characters. However, she isn’t simply a plot device – Suliak interprets her with both vulnerability and resourcefulness. The plot of Charitable Sisterhood is meandering, but it isn’t aimless. The characters don’t develop by forcing each other to confront their inner selves; rather, it is through kindness and patience that they change for the better. This is a more realistic way of approaching the relationships between women whose primary social outlet is a charitable organization, and an interesting change in a theatrical environment filled with shattered families and dramatic confrontations. Just like the seemingly endless pile of donations onstage, the problems facing the characters in Charitable Sisterhood don’t immediately vanish. The audience is left wondering about everyone’s fate, but also understanding the quirks and relationships of a part of America detached from our own. Charitable Sisterhood at Dragon Productions is perfect for fans of character-driven shows and enthusiasts of plays set in the South. Charitable Sisterhood runs through June 4th.